This recipe is the result of testing different variations to come up with the best recipe. 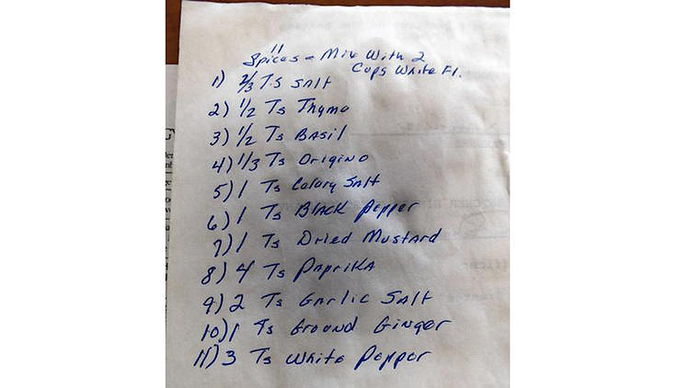 There are lots of recipes on the interwebs claiming to approximate America’s favorite fried chicken spice and herb blend. It just took a little tweaking and ketofying to make it work for me. My daughter, Emmy, and I did an experiment. We ultimately did three versions of the spice blend. The first one used black pepper instead of white pepper. The second batch (with the white pepper) needed more salt and sage. That batch was okay but we had to cut back the sage a little. We also fried the chicken in three different fats: peanut oil, lard (pork fat), and tallow (beef fat). The tallow won hands down. The peanut-oil-fried chicken was flavorless, and the chicken cooked in lard was too porky, but the tallow-fried chicken was crispy and delicious. I was lucky to find a local butcher that sells beef tallow. It also happens to be the healthiest fat you can fry in. I would recommend spending some time to find a reliable source. 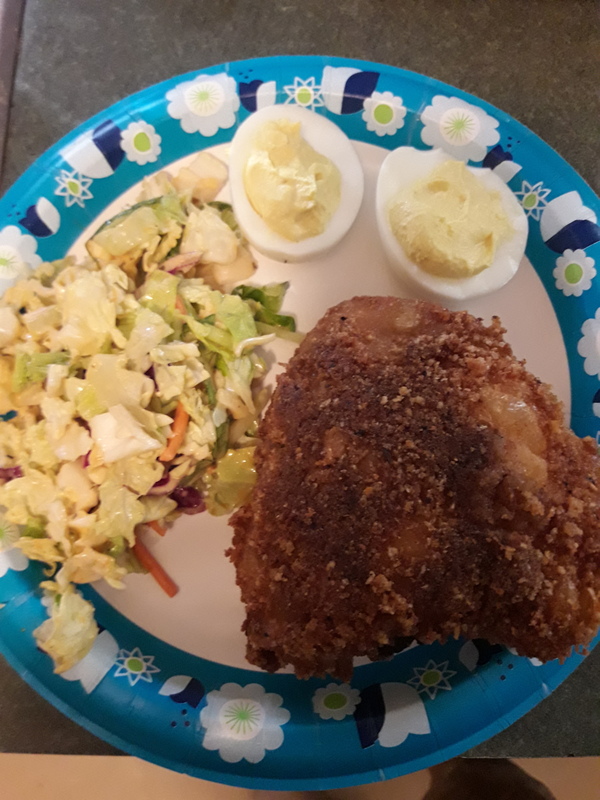 For the full experience, make my Ketoky Fried Chicken Style Cole Slaw and Biscuits! A keto version of fried chicken that rivals the best. Heat tallow in a fryer to 350F. Combine pork rinds, cheese, and spices in a food processor until rinds are pulverized and powdered. Move to a plate or large bowl. Dry each chicken piece with a paper towel and dip into the egg white to coat them. Completely coat with pork rind mixture and place on a tray to dry for about 5 minutes. Fry the breasts and wings for 12-14 minutes. Fry the legs and thighs for 14-16 minutes. In either case, the internal temperature of the thickest part of the meat should be 165 F.
Place the chicken on paper towels or a cooling rack, let it rest for 3 or 4 minutes, and then serve. You can keep it warm in a 200 F degree oven for a few hours before serving. The real deal! Taste it and see? Thank you for testing out the recipes for us. I am looking forward to eating the result next Saturday. I know it will be great. Hail to the Colonel! Thanks for the recipe! This was Father’s Day dinner tonight! It was perfect. The chicken was SO crunchy. Loved it! Many times over. I buy fryer oil filters at BassPro and run mine through it every couple times it makes it like new again. You loose some each fry so as you add new your always just moving the cycle further with newer tallow.